Rattata! Pokemon One a Day! 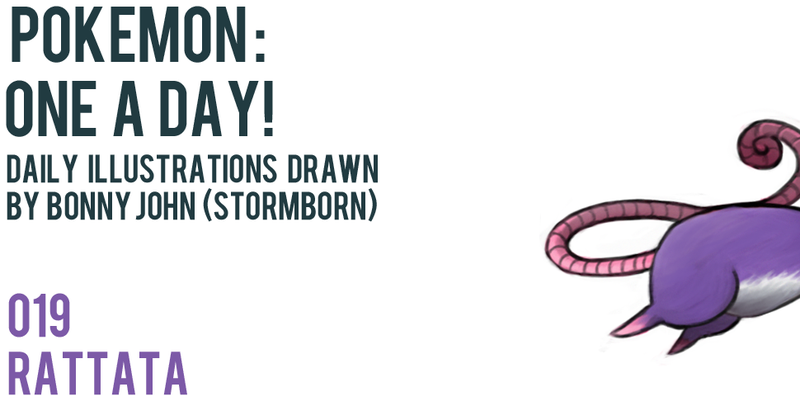 Ratatatatatatatatatttatatatata is today's Pokemon for the day! 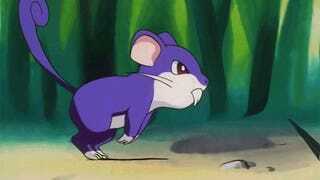 The...mouse pokemon. wut? but your name is ratatatataratarrataerijaer I originally had a more realistic take on it, taking a real chubby looking rat and painting him purple with the pink bits as you see here. It was rather...ugly and very uninspired. Thus, I cartoonized him and found him to be a lot cuter and more fitting to his original design, although I've made a number of changes to that. Generally, its all the pink I introduced to the critter. Pink hands and feet, a proper pink tail with rings, the inner ear is now pink and he has a nose...which is something he didn't have before. I mean, he had the nostril flairs but not a "sonic the hedgehog" nose that he has now. I was planning on drawing several mice running alongside with him, to showcase the lot of them stealing food and escaping from an unseen threat (humans, probably) but scrapped it because I wanted to feature that idea for a more "deserving" Pokemon. It also got me to thinking about expanding how I tackle the canvas, as its been pretty straightforward with just the pokemon in the middle and that's that. However, the uniformity does make for a nice slideshow. And that's today's Pokemon of the Day! Be sure to share the work. Thank you for viewing, see you tomorrow! -Bonny + Pokemon One a Day is a series illustrated and curated by Bonny John in an effort to represent the entire catalogue of characters from the world wide phenomenon that is known as Pokemon. The idea is simple - to draw and share one new Pokemon a day (weekends off!) until every Pokemon is completed. This project is an exploration of fine art styles for learning and leisurely purposes.